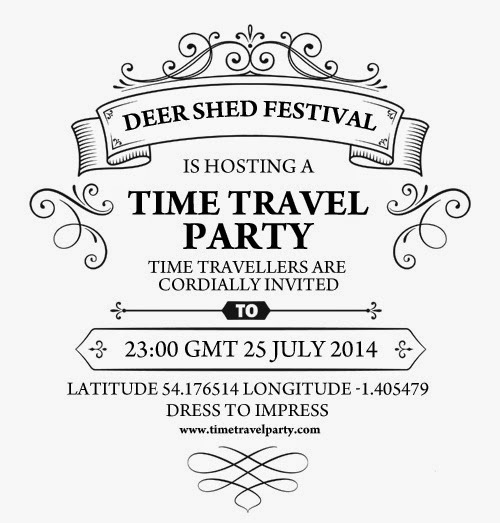 Our favourite festival, Deer Shed, is hosting a party for Time Travellers to celebrate their Time Travel Theme for Deer Shed 5. It promises to be a special end to the first day of the festival and given that the music line-up includes Johnny Marr, British Sea Power, Stornoway, Steve Mason, Pins, Wolf Alice, Georgia Ruth and a ton of others you start to wonder what more they could possibly add to make it better. That said, there's still the literature and the PG comedy tent to come so I guess we'll know the answer soon. So, if you happen to know any travellers across time and space, forward them the invite below and tell them to come along. 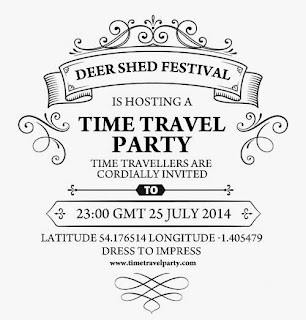 The theme for this year's Deer Shed Festival is Time Travel, and the festival organisers are going to be hosting an ambitious Time Travel Party to celebrate. A Time Travel Party is like any other party, with music and nibbles, except that you invite time travellers from the future to attend as well as guests from 2014. You can't expect time travellers from the past to turn up because time travel hasn't been invented - this time travelling thing can mess with your head! "Of course inviting time travellers from the future isn't an exact science", says festival organiser Oliver Jones, "but as a starting point the invitation itself has to persist until time travel is possible". With this in mind Oliver has decided to get the invitation engraved into a brass plaque which he intends to firmly secure to the obelisk in Baldersby Park where the party is to be held. The plaque contains all the party particulars including the time, the place and also a 'dress to impress' dress code. The festival team hopes that it will be discovered at some point in the future when time travel is as common as a trip to the supermarket. However, Oliver is not sure that the invitation alone will convince the time travellers. "You have to imagine you are a time-travel-agent, why come to 2014 and not some other year?" The festival team decided to have an enormous pan-dimensional shout-out to further encourage time travellers and so built a website, www.timetravelparty.com, where people can submit a photo or an image that is dear to their heart. "We hope that this mass emotional offering will somehow arch across time and strike a chord". So far people have submitted all sorts of imagery to the site – from favourite childhood holidays to a pair of old goalkeeping gloves, and the comments accompanying each picture are suitably heart-warming. Alongside the party of the centuries, this year’s Deer Shed Festival will include a range of time travel themed family workshops and activities including; the opportunity to meet and interact with our time travellers, robotic upgrades to your favourite cuddly toy or ‘Tedroid’, castle building, a full sized medieval trebuchet and the chance to build a Time Machine. For rest of us that little bit too old to admit to still owning a teddy or not inclined to a build castle, our headliner Johnny Marr may well transport a few of us back to our teenage years. With British Sea Power, Stornoway, Steve Mason, Cate Le Bon and a host of other musical moments on the bill alongside Johnny and our PG rated Comedy, literature and cinema line up to come, Deer Shed 5 is all set to be our best yet. Tent camping and car park are free to ticket holders. FOR INFORMATION ON ALL ASPECTS OF THE FESTIVAL INCLUDING TERMS AND CONDITIONS RELATING TO TICKETS GO TO www.deershedfestival.com. We are massive fans of music and the arts in general, and we all have kids. We have over the years got increasingly fed up with paying a small fortune to get our families into various festivals only to be disappointed in the music or in the entertainment, facilities and vibe for the sprogs. The Deer Shed Festival is our long considered response to this. Kids are not second class citizens at DSF. However, we will not compromise on what's on just because we are 'family friendly'. If you don't have children to bring along you will still find a lovely chilled atmosphere in which to enjoy a great weekend. This is the fifth Deer Shed Festival. The team behind it have been in place from the start and families are at the heart of the preparations and the activities and services on site. In the last five years we have grown in attendance but are sensible to making sure that we never get too big. Those five years have seen a host of amazing bands play including Edwyn Collins, I Am Kloot, Saint Etienne, The Wedding Present, The House Of Love and Field Music. Please reference the event with its full title of Deer Shed Festival where possible.